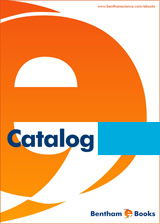 An online submission and tracking service via internet facilitates a speedy and cost-effective submission of manuscripts. Manuscripts and the full thematic issues must be submitted online via Bentham's Journal Management System (JMS) at https://bentham.manuscriptpoint.com/journals/pri / View Submission Instructions. The journal publishes peer-reviewed full-length / mini-review articles and research articles, and drug clinical trial studies written in English. Single Topic/Thematic Issues by invited Guest Editors are also considered for publication. These special issues are peer-reviewed and may contain invited or uninvited review/mini-review articles or a mixture of research articles and reviews/ mini-reviews. A Single Topic Issue Editor will offer a short perspective and co-ordinate the solicitation of manuscripts between 3-5 (for a mini-Thematic Issues) to 6-10 (for full-length Thematic Issues) from leading scientists. Authors interested in editing a single topic issue in an emerging topic of anti-infective drug discovery may submit their proposal at thematicissue@benthamscience.net for consideration. 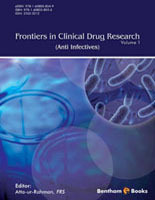 A separate section of important and recent patents on anti-infective drug discovery is also included in the journal. The patents annotated in this section are relevant to the articles published in this journal issue, categorized by therapeutic areas/targets and therapeutic agents related to anti-infective drug discovery. Authors should review the most recent and important patents based on the topic covered. Coverage of novel bioactive compounds, analogs & targets, techniques and drug design in all areas of anti-infective drug discovery should be emphasized, including the significance of reported patents. The title of the article should be precise and brief and must not be more than 120 characters for review and research articles and 100 characters for Patent Summaries. Authors should avoid the use of non-standard abbreviations. The first letter of each word should be in capital letters except for articles, conjunctions and prepositions. The names of the authors should be provided according to the previous citations or as the authors would want them to be published along with the institutional affiliations, current address, telephone, cell & fax numbers and the email address. Email address must be provided with an asterisk in front of the name of the principal author. The corresponding author should also be designated and the full address, telephone, cell & #x0026; fax numbers and the email address must be stated to receive correspondence and galley proofs. For Research Articles the manuscript should begin with the title page and abstract followed by the main text, which must be structured into separate sections as Introduction, Material and Methods, Results, Discussion, Conclusion, Ethics Approval and Consent to Participate, Human and Animal Rights, Conflict of Interest, Acknowledgements and References. If your research article reports the results of a controlled health care intervention such as a Drug Clinical Trial Studies/Case Report, list your trial registry, along with the unique identifying number. The patent registration number and patent authority of the author's intellectual property must be cited in the article. The µ in µg or µm should be in Roman. The symbol for litre is L and that for minute is min. For temperature, please use only one of °C, & °F or K in the entire manuscript. As the Angström (1#Å = 10-10 m) is not an SI unit, it should be replaced by the nanometre (1nm = 10-9 m) or by the picometer (1pm = 10-12 m): 1# Å = 0.1nm = 100 pm. Multiple units should be written with negative superscripts (for example, 25mgµL-1 µs-1). The list of notations should appear just before the first paragraph of full text. National Library of Medicine. Specialized Information Services: Toxicology and Environmental Health. Available at: sis.nlm.nih.gov/Tox/ToxMain.html (Accessed on: May 23, 2009). Masure, H.R., Pearce, B.J., Tuomanen, E. Bacterial exported proteins and acellular vaccines based thereon. WO9506732 (1995). Nawaz, A., Lonardo, E.C., Patel, K.J., Lin, S.Y., Matheson, J., Wearley, L.L. Concomitant oral and topical administration of anti - infective agents. WO03032985 (2003). Bearss, D.J., Vankayalapati, H., Xu, Y., Fischetti, V.A., Stebbins, C.E. Oxo-imidazolyl compounds having antibacterial activity. WO2009139870 (2009). Mandeville, W.H., Neenan, T.X., Holmes-Farley, S.R. Ionic polymers as anti-infective agents. US20010053794 (2001). Stefanadis, L.G. Stable liquid formulations of anti-infective agents and adjusted anti-infective agent dosing regimens. US20090227554 (2009). Capps, D. Novel anti infective agents and means of producing the same. US3758491 (1973). Klein, L.L., Huang, P.P., Randolph, J.T., Hutchinson, D.K., Yeung, M.C., Flentge, C.A. 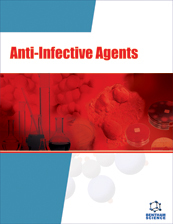 Anti-infective agents. US7517876 (2009). Bright, G.M. Heptanoyl-glu-asp-ala-amino acid immunostimulants. EP231087 (1992). Meisel, A., Prass, K., Meisel, C., Halle, E., Dirnagl, U., Volk, H.D. Anti-infective agents and/or immunomodulators used for preventive therapy following an acute cerebrovascular accident. EP1480646 (2008). All authors must strictly follow the guidelines below for preparing illustrations for publication in Recent Patents on Anti-Infective Drug Discovery. If the figures are found to be sub-standard, then the manuscripts will be rejected. For more information please contact the Editorial Office by e-mail at pri@benthamscience.net. Regular manuscripts may be submitted directly to the Editorial Office by e-mail to qasit@benthamscience.net or pri@benthamscience.net.